What Is The Future Of VR In Business? - Duffy Group, Inc.
What Is The Future Of VR In Business? In an era of exciting new technologies, virtual reality (VR) may be the most compelling of them all. Consumer VR systems, such as the Oculus Rift, are growing in popularity, as the technology has grown more refined and costs have been lowered. After decades of false starts, VR has reached a point where the experiences are immersive enough to truly feel real. As the world’s largest tech companies pour billions into VR research, we’re likely to see startling advances in the power and application of VR. Yet consumer VR is just one part of the picture; augmented and virtual reality systems may have an even more profound impact on the way business is conducted. With that in mind, let’s take a look at what the future might hold for VR in the business world. The immersive feel of VR is a perfect match for marketing. By creating realistic environments for consumers to experience, brands can demonstrate how a product or service works or even show how it will integrate into someone’s life. Today, boutiques are using VR technology to allow customers to quickly and easily try on a large number of “digital” clothes, for example. Additionally, VR technology is being employed to create deeply immersive narrative experiences in place of traditional print and video media campaigns. As the technology matures, these efforts will become vastly more complex and detailed, making traditional advertising and marketing look static and one-dimensional by comparison. Finding and hiring the best talent is critical for firms seeking a competitive edge. Continuing advances in VR technology may revolutionize the way that process is conducted. 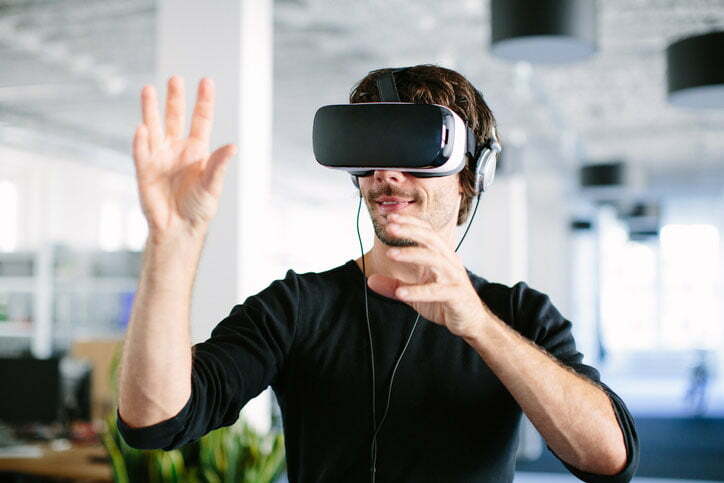 Instead of relying on interviews to determine if a candidate is a good fit for a company and its culture, hiring managers will be able to use VR to have prospective hires visit the company within virtual space. By doing so, companies will gain a deeper perspective into the suitability of candidates — and those potential hires will have more information to assess before making an offer. The potential uses for VR inside the modern corporate office are nearly limitless. Consider how useful immersive landscapes will be in terms of training new employees, or offering current employees continuing education or skill development. Remote workers will be able to use VR to collaborate more closely with office staff, allowing companies and workers the benefit of flexibility without losing the spirit of innovation that comes with working in close proximity. Meetings, too, will be conducted in VR, allowing workers in far-flung areas to operate within the same space. The process of building and testing prototypes will be utterly transformed by VR technology. Companies will be able to use VR to allow product testers to provide deeper insights into the way something works, or how it feels to end users. Meanwhile, corporate leaders will be able to use these insights — and their own VR-assisted impressions — to make more informed decisions about the market viability of new products and services. In the coming years VR technology will radically alter many existing business processes. The way we develop, sell and market products will be transformed. Companies with the foresight to remain at the vanguard of these changes will be in the best possible position to compete.